Pietro Vichi Domenici (May 7, 1932 – September 13, 2017) was an American attorney and politician from New Mexico. A Republican, Domenici served six terms in the United States Senate, from 1973 to 2009, the longest tenure in the state's history. During Domenici's tenure in the Senate, he advocated waterway usage fees, nuclear power and related causes. After leaving the Senate, Domenici served as a senior fellow for the Bipartisan Policy Center. Domenici was born in Albuquerque, New Mexico, to Alda (née Vichi), an undocumented immigrant, and Cherubino Domenici, both of whom had been born in Modena, Italy. Domencini worked in his father's grocery business after school. In 1950, he graduated from St. Mary's High School in Albuquerque. He spent two years at the College of St. Joseph on the Rio Grande before earning a degree in education at the University of New Mexico, Albuquerque in 1954, where he was a member of Sigma Alpha Epsilon fraternity. He pitched for one season for the Albuquerque Dukes, a farm club of the Brooklyn Dodgers. He taught mathematics at Garfield Junior High in Albuquerque. Domencini earned his law degree at the University of Denver law school in 1958 and returned to practice law in Albuquerque. In 1966, Domenici successfully ran for a position on the Albuquerque City Commission and in 1968 was elected Commission Chairman. Domenici was unsuccessful in his 1970 bid in the New Mexico gubernatorial race, losing to the Democrat, former state House Speaker Bruce King, who won 148,835 votes to Domencini's 134,640. 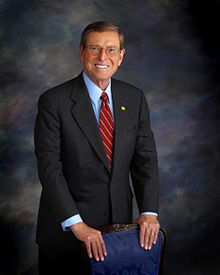 In 1972, Domenici successfully ran for a position in the U.S. Senate and became the first New Mexico Republican to be elected to the position in 38 years. He was aided by Richard Nixon's landslide win over Democrat U.S. Sen. George McGovern at the top of the ticket. Domenici polled 204,253 votes (54 percent) to 173,815 (46 percent) for Democrat Jack Daniels, a Hobbs realtor. Domenici was subsequently re-elected in 1978, 1984, 1990, 1996, and 2002 and is to date the longest-serving senator in his state's history, having served in the legislative body for 36 years. At the time of his retirement, he was the ranking member of the United States Senate Committee on Energy and Natural Resources and the United States Senate Appropriations Subcommittee on Energy and Water Development. He was also a member of the U.S. Senate Committees on Appropriations and Indian Affairs, and served as Chairman and Ranking Minority Member of the Budget Committee. He advocated for the mentally ill, having pushed the Mental Health Parity Act of 1996. One of the first issues that Domenici concerned himself with was waterway usage fees, in spite of his state lacking any waterway capable of commercial traffic. The idea behind a waterway usage fee was that the Army Corps of Engineers built dams and other expensive waterway projects, which the barge industry were able use for free. In 1977, Domenici set himself to the task of enacting a waterway usage fee. After a long two-year battle with stiff lobbying on both sides, the waterway fee was finally passed along with a new lock and dam project (the rebuilding of Lock and Dam 26.) Reporters attributed the passage of this fee in no small part to Domenici's legislative skill. The legislation was signed into law in 1978. The issue greatly assisted Domenici in his home state, where the railroad industry was a significant player (railroads competed with barges, and they long wanted to end the "free ride" issue). The railroads donated $40,000 to Domenici's campaign, and the barge industry gave a small sum to his opponent. He was reelected in 1978 with 53.4% of the vote over Democrat Toney Anaya, a former New Mexico Attorney General. The 6.8% victory margin would be Domenici's closest election in his Senate career. Domenici has been an avid proponent of nuclear power and published two books on the subject: A Brighter Tomorrow: Fulfilling the Promise of Nuclear Energy (Lanham, Maryland: Rowman & Littlefield Publishers, 2004), which he wrote; and Advanced Nuclear Technologies — Hearing Before the Committee on Appropriations, U.S. Senate (Collingdale, Pennsylvania: D I A N E Publishing Company, 1999), which he edited. Prior to the 2006 midterm election Domenici called and allegedly pressured then-United States Attorney for the District of New Mexico David Iglesias to speed up indictments in a federal corruption investigation that involved at least one former Democratic state senator. When Iglesias said an indictment would not be handed down until at least December, Domenici said "I'm very sorry to hear that" — and the line went dead. Domenici's telephone manners were the subject of a later article in The Albuquerque Journal, which quoted numerous other sources whom Domenici had treated rudely by hanging up after making a point or receiving an unsatisfactory answer. Iglesias was fired a little over one month later by the Bush Administration. In a March 2007 statement, Domenici admitted making such a call. House Judiciary Committee Chairman John Conyers, D-Mich., issued subpoenas to require Iglesias and three other ousted U.S. attorneys to testify before Congress. Domenici later admitted calling Iglesias, though Domenici claimed he never used the word "November" when he called Iglesias about an ongoing Albuquerque courthouse corruption case. Domenici denied trying to influence Iglesias, and hired lawyer K. Lee Blalack II to represent him. According to the Justice Department, Domenici called the Department and demanded Iglesias be replaced on four occasions. According to The Washington Post, on the day of the firing (December 7, 2006) William Kelley, a deputy to then White House Counsel Harriet Miers, said in an email that Domenici's chief of staff was "happy as a clam" about the Iglesias firing. A week later, a Justice Department email to the White House counsel stated: "Domenici is going to send over names tomorrow (not even waiting for Iglesias's body to cool)." On April 24, 2008, Domenici was admonished by the Senate Ethics Committee for "inappropriately" contacting in 2006 one of the nine U.S. attorneys later fired by President Bush. The committee found "no substantial evidence" that Domenici tried to influence attorney David Iglesias when he contacted him to inquire about the status of a 2006 investigation into corruption charges on a state Democratic official. A possible indictment could have buoyed the re-election hopes of Rep. Heather Wilson (R-N.M.), who was seeking to replace Domenici when the senator retired. Iglesias charged that Domenici and Wilson were pressuring him to wrap up the investigation before that November's elections, a violation of ethics rules. The Ethics Committee said that Domenici's phone call to Iglesias, in advance of an upcoming election, "created an appearance of impropriety that reflected unfavorably on the Senate". In July 2010, Department of Justice prosecutors closed the two-year investigation without filing charges after determining that the firing was not criminal, saying "Evidence did not demonstrate that any prosecutable criminal offense was committed with regard to the removal of David Iglesias. The investigative team also determined that the evidence did not warrant expanding the scope of the investigation beyond the removal of Iglesias." Domenici said of the closed investigation, "The Justice Department has now confirmed what I have always said and believed: I never attempted to interfere with any government investigation. I am glad that this matter has concluded." The organization Republicans for Environmental Protection singled out Domenici as "Worst in the Senate in 2006" on environmental issues. In addition to assigning Domenici a score of zero for his environmental voting record, the group issued him "environmental harm demerits" for what they saw as two particularly irresponsible acts: first, for spearheading efforts to include in federal budget legislation provisions for "speculative revenues from oil drilling in the Arctic National Wildlife Refuge; second, "for sponsoring and securing passage of S. 3711, the Gulf of Mexico Energy Security Act, which would perpetuate America's dangerous oil dependence, set a precedent for drilling in sensitive marine waters, and direct a disproportionate share of federal royalty revenues from a public resource to four states." Domenici also received an exceptionally low environmental rating from the League of Conservation Voters, who claimed in 2003 that "[d]uring the last decade his voting record has become even more strikingly anti-environmental." The LCV went on to criticize Domenici for voting in 1995 "to allow mining companies to 'patent' (purchase) public lands in order to extract minerals from them, without environmental standards, for the ridiculously low 'price' of $5 an acre or less." On October 4, 2007, Domenici announced his decision not to seek re-election to the Senate in 2008 for health reasons (specifically, frontotemporal lobar degeneration). His seat was won by Democrat Tom Udall. Domenici and former OMB director and CBO director Dr. Alice Rivlin chaired a Debt Reduction Task Force, sponsored by the Bipartisan Policy Center in Washington. The task force was announced at a joint press conference on January 26, 2010, in Washington. The task force began its work in February 2010 and, led by Domenici, released a report on November 17, 2010 on ways to address and reduce the national debt and deficit. The Domenici Institute, which aims to continue "Domenici's legacy of service to the state of New Mexico", bears his name. After graduating law school in 1958, Domenici married Nancy Burk. Together, the Domenicis had two sons and six daughters (Lisa, Peter, Nella, Clare, David, Nanette, and twins Paula and Helen). One of his daughters has schizophrenia; this reportedly influenced his decision to become a strong supporter of legislation providing for parity in insurance coverage for mental illness. During the 1970s, Domenici fathered a child, Adam Laxalt, with Michelle Laxalt, a Republican staffer and lobbyist and the daughter of Domenici's then-Senate colleague, Nevada Republican Paul Laxalt; this fact was kept secret until 2013. In 2013, Domenici, then 80, acknowledged the affair and his son, saying he was "very sorry" for his behavior. Adam Laxalt ran for Attorney General of Nevada in the 2014 election and defeated Democrat Ross Miller. Laxalt was the Republican nominee for Governor of Nevada in the 2018 election, but lost the general election to Steve Sisolak. Domenici died aged 85 on September 13, 2017 at the University of New Mexico Hospital in Albuquerque, New Mexico from complications that resulted from abdominal surgery. His funeral was held on the morning of September 16 in Albuquerque. "Advanced Nuclear Technologies — Hearing Before the Committee on Appropriations, U.S. Senate" (Collingdale, Pennsylvania: D I A N E Publishing Company, 1999. ISBN 978-0756702601), which he edited. Energy Policy Act of 2005, sponsored by Senator Domenici and Representative Joe Barton. New Mexico State University's Domenici Institute. ^ Kiely, Kathy (June 4, 2007) "Personal histories shape immigration views", USAToday.com; accessed April 17, 2018. ^ "Famous Italian Americans". Archived from the original on December 16, 2006. ^ "1". freepages.genealogy.rootsweb.com. Retrieved 2017-09-14. ^ New Mexico State University-Biographical Sketch of Pete V. Domenici, domenici.nmsu.edu; accessed April 17, 2018. ^ Pete Domenici, golobos.com; accessed April 17, 2018. ^ Sen. Pete Domenici Special Section, scribd.com; accessed April 17, 2018. ^ An Immigration Debate Framed by Family Ties. – The New York Times. – April 4, 2006. ^ Pete Domenici, ourcampaigns.com; accessed April 17, 2018. ^ a b c d e Brian Naylor (September 13, 2017). "Pete Domenici, Former Senator And Balanced-Budget Advocate, Dies". NPR. Retrieved September 13, 2017. ^ a b c d e "Pete Domenici, former GOP senator from New Mexico, dies at 85". Los Angeles Times. September 13, 2017. ^ a b c d e "Pete Domenici, Long a Powerful Senate Voice on Fiscal Policy, Dies at 85". The New York Times. September 13, 2017. Retrieved September 13, 2017. ^ a b c d e f g h i j k l m n o p q r s t u "DOMENICI, Pete Vichi - Biographical Information". Bioguide.congress.gov. Retrieved April 17, 2018. ^ "Senators Talk About Their Votes in the Impeachment Trial". New York Times. February 13, 1999. Retrieved February 28, 2013. ^ a b "Ex-New Mexico Sen. Pete Domenici Dies at 85". UPI. Retrieved September 13, 2017. ^ a b c "Pete Domenici: Nuclear Renaissance Man – Power Play". – MSNBC.com. ^ Reid, T. R., & Writer, W. P. S. (June 23, 1977). – "U.S. waterway tolls approved by senate". – The Washington Post. ^ a b T.R.Reid, (1980). Congressional Odyssey: The Saga of a Senate Bill. W.H. Freeman & Company. ^ a b c d e f Eggen, Dan (March 5, 2007). "Senator Admits Calling U.S. Attorney". The Washington Post. Retrieved March 16, 2006. ^ Taylor, Marisa (March 1, 2007). "Sources: GOP lawmakers tried to influence federal investigation". The McClatchy Company. Retrieved March 16, 2006. ^ Brosnan, James (March 7, 2007). "Domenici denies mentioning `November' in Iglesias call". The Albuquerque Tribune. Archived from the original on March 15, 2007. Retrieved March 16, 2006. ^ Johnston, David (March 8, 2007). "Inquiry Into Ouster of U.S. Attorneys Moves Toward Subpoenas at Justice Department". The New York Times. Retrieved March 16, 2006. ^ Pfeiffer, Eric (March 6, 2007). "Justice stymieing probe of 6 firings, Democrats say". The Washington Times. Retrieved March 16, 2006. ^ Eggen, Dan; Solomon, John (March 12, 2007). "Firings Had Genesis in White House (page 3)". The New York Times. Retrieved March 16, 2006. ^ a b "DOJ: Prosecutor firing was politics, not crime". News.yahoo.com. Retrieved April 17, 2018. ^ a b Dana Bash (October 4, 2007). "Domenici will not seek re-election because of brain disease". CNN. Retrieved September 13, 2017. ^ "Pete Domenici, former New Mexico GOP senator, dead at 85". Fox News. September 13, 2017. Retrieved September 13, 2017. ^ a b c "Pete V. Domenici bio". Demenici.nmsu.edu. Retrieved September 13, 2017. ^ Cillizza, Chris. "Sen. Pete Domenici Expected to Retire". – "The Fix". – The Washington Post. – October 3, 2007. ^ "The Domenici-Rivilin Debt". The Foundry. The Heritage Foundation. January 26, 2010. Archived from the original on January 27, 2010. Retrieved January 27, 2010. ^ "Bipartisan Policy Center Domenici-Rivlin Task Force Begins Exploring Solutions to Debt Crisis". Bipartisan Policy Center. February 26, 2010. Archived from the original on November 21, 2010. ^ Haussamen, Heath (November 18, 2010). "Domenici-led group pushes new national sales tax". NM Politics. ^ Bradford, Amanda (August 11, 2014). "Domenici conference probes top issues". Albuquerque Journal. Retrieved October 7, 2014. ^ "Pete Domenici: Profile". Congressional Record: Senate. 152 (13): 17411. September 7, 2006. ^ Hulse, Carl. "The New York Times biographical note on Pete V. Domenici". Retrieved May 22, 2010. ^ Robertson, John (February 20, 2013). "Domenici Discloses Son Born in secrecy". Albuquerque Journal. Retrieved February 21, 2013. ^ Walshe, Shushannah (February 20, 2013). "Former Senator Admits To Fathering Child With Other Senator's Daughter". ABC News. Retrieved February 28, 2013. ^ "Pete Domenici Acknowledges Son From Extramarital Affair 30 Years Ago". Huffington Post. February 20, 2013. ^ "Las Vegas Review-Journal". Las Vegas Review-Journal. Retrieved April 17, 2018. ^ "Longtime GOP senator Pete Domenici dies". Politico.com. Retrieved April 17, 2018. ^ Dan Boyd (September 14, 2017). "Funeral services set for Pete Domenici, former U.S. senator". Albuquerque Journal. Retrieved September 15, 2017.